We’ve been doing a fair amount of interviewing recently and one of our big questions is What do you do if a user reports slowness? Like many of our questions, it’s huge and open-ended. I mean there are so many possibilities that could be wrong and depending on your experience you could go in so many different directions. The most common starting point I hear is Check for blocking, followed closely by Check the DMVs and in third place is Check for CPU, memory, etc pressure on the server. None of these are bad answers, but really what I’m hoping for. I’m a nice guy though so I always give a leading question in my second question. How would you handle an automated alert differently? Say at 1am? Now fair enough, we are on to a new question, not that initial one, but I did have one person go back and add what I was looking for. But in all the interviews I’ve been part of exactly one person hit on it first try. So don’t feel bad if you haven’t gotten it yet, or heck, if you are actually one of those interviewees. So what am I hoping for? What is the first thing you should do when a user reports a problem? TALK TO THE USER. Are you the only one experiencing the problem? When did you start noticing a problem? Has anything changed since then? Do you see an error? If so please send it to me. The exact error, not just in general. I mean really, if you don’t know what the problem is, how are you going to fix it? You can certainly start checking the most common issues, but you are just as likely to be looking in entirely the wrong place. So talk to the user first, ask some questions, narrow the field down, then start looking for an answer. All of that said, I frequently have a script up that’s similar to sp_WhoIsActive so while the phone is dialing I’ve probably already checked for blocking and a few other generic performance issues. I use this question too. My favorite answer was the person who insisted that getting the report could not go forward until there was a help desk ticket and refused to answer until I assured them that, yes, in fact, there is a help desk ticket. They then asked for the number. Needless to say, the interview did not actually go well. Looks like we have different environments and experiences. For me, asking about the help desk ticket and number is the correct answer. It would be hard to justify having a DBA or system admin talk to the end-user as the first step without first having verified that a help desk ticket exists(and who it is assigned to), and second, seeing where the priority of a slowness incident falls in the backlog of requests. A good(or even fair) ITIL process with any kind of help desk would have already talked to the end-user and gathered the information, screen shots, steps, and a number of basic questions, since reporting slowness would not be a unique request. Unless the help desk processed failed of course, and then the processes would be reviewed and training provided to the help desk. I’ve seen both large(over 5000 people) and small(less than 30 people) companies have very strict policies on support resources and help desk ticket support processes. In many cases, the user is not contacted directly by the DBA or system admin at any point in the process, as it would be quite possible that the help desk would relay the information. Lastly, it is very important to check the size of the tempdb and see if the most recent index rebuild and statistics update job completed successfully or failed last night or recently, or is still in the process of running. While I can understand the idea that following processes is important, and you could even mention that during an interview. Actually requiring that the interviewer give you a fake request number before continuing on seems a bit over the top. Not to mention that part of doing a good job with an interview (IMO) is to understand the purpose of the question. Saying “I would ask for a request number first, assuming this is required in this companies procedures, then I would …..” is perfectly reasonable. “I would ask for the request number.” full stop, not so much. Again, in my opinion. Hey guys, I’m not questioning the need for a tracking system for calls. That’s not the point. The point is, it’s an interview to understand a persons knowledge of SQL Server, not their knowledge of a particular internal process. 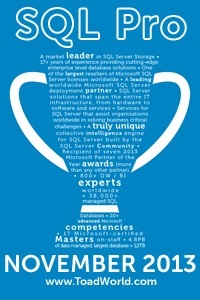 The individual in question was WAY more focused on process than on SQL Server. They didn’t give good answers at all on SQL Server. They did however, have that process down cold and insisted that I, a person at a different company, with a different process, that has ZERO relation to the job, the question, or anything else, follow it. You don’t find that a little off? Even if I have 20 years experience in BI/DW doing all range of roles from developer to lead and architect and also being on both sides of interview table I am still nervous during interviews. The main reason is that sometimes there are EXPECTED answers to the questions. And if you get a bit different on the approach you get severe penalty – NO job for you. Some of those interviews get so “literal” that you are expected to point out all correct syntax on a command which you would google. No brain here as soon as you know there is such command which will do the job.! I would rather give more freedom to the candidate and walk through him/her on some past examples from his experience asking how certain issues have been resolved and why. Especially for higher level roles. To me is more important somebody to understand concepts and different approaches and consequenses of it rather than too much speifics. If I am interviewing a developer I could just give him/her a computer and example asking a task to be completed with open book opportunity (very similar to what is in the real working environment).Unfortunately some people don’t realise how important is the role of interviewers and how sometimes they could make live misarable to a good person who could bring great benefit to the team.